Asia is home to the largest and fastest growing countries in the world, both in terms of population and economic size. With its current size and anticipated rapid economic transformation and growth, the highest rural-to-urban shift is expected to occur in Asia. As the population and urbanization increases, demand for housing for owner-occupancy and rental increases. Resources already devoted to housing become strained due to limited supply of land in cities. The inadequate supply of housing in the region can be seen in the high house-price-to income ratios and high share of slum dwellers in the urban population. A decent 35 sq. m. condominium unit in the city centre costs around six to thirty times the annual average income. Table 2 below shows that there are serious affordability issues in Asian cities, especially in Seoul, Manila, Jakarta and Shanghai. About a third of East Asia's urban population lives in slums, a ratio that is higher than other middle-income countries in Latin America and the Middle East. In Southeast Asia, one out of every four urban residents lives in slums. There are about 250 million slum dwellers in South and South East Asia, 178 million in China alone. Countries with serious slum problems include Indonesia (with 21 million slum dwellers), Philippines (20 million) and South Korea (14 million) [UN Habitat 2003]. These are the same countries that have serious housing affordability conditions. Asian housing markets differ widely due to the different levels of economic development and different economic systems adopted by each country. Less than 50% of households are homeowners in Seoul, Manila and Tokyo. On the other hand, the homeownership rate exceeds 80% in Jakarta, Taipei and Singapore. Developing countries in Asia do not provide sufficient protection of property rights. Poor governance and weak control of corruption are also observed in China, Indonesia and the Philippines. In the Philippines, only 10 million of the estimated 25 million (40%) parcels were registered. Further, at the current rate of property titling in the Philippines, it is estimated that it will take 75 years before complete titling coverage is achieved. In China, the influx of foreign investment in the real estate industry has led to illegal land grabbing in rural areas. The Ministry of Land and Resources recently reported that about to 60 to 90% of land acquisitions are illegal [BBC 2006]. The Philippines has the most number of procedures involved in registering property, followed by Indonesia and South Korea. Foreigners face several ownership restrictions in Indonesia, Thailand and the Philippines. On the other hand, the real estate markets of Japan, Hong Kong, Singapore and South Korea are generally open to foreigners. The sale and purchase of property involve many costs: registration costs, real estate agent fees, legal fees, and sales and transfer taxes. Registration costs include stamp duties, deed taxes and notary fees. In most countries in Asia registration costs are low. Countries with less transparent markets and more registration procedures have higher estate agent fees, particularly the Philippines and Indonesia. Legal fees generally do not exceed 1% of property value. 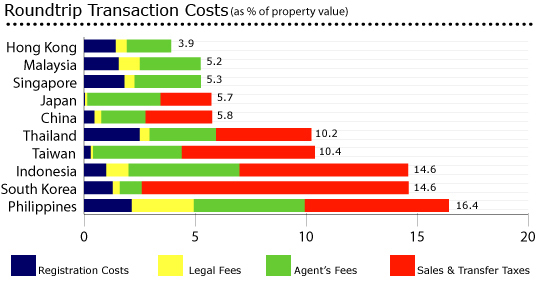 Legal fees tend to decrease in terms of percent of property value as the sales price increases. In the Philippines, however, legal fees are substantial and there is a tendency that legal fees increase as the property price increases because of the higher risks involved. Sales and transfer taxes are substantial and typically comprise the bulk of transaction costs in several high cost countries. To analyze the transaction costs more clearly, a hypothetical case is adopted where a resident citizen of the country purchases a property that is worth ten times the country's gross national income per capita. To make the case as simple as possible, the property is paid in cash. The unit is a condominium located in a major city. The property was used by the seller as his principal residence for the past ten years. Roundtrip transaction costs in property exchanges are generally below six percent in China, Hong Kong, Japan, Malaysia and Singapore. On the other hand, total costs in Taiwan, Thailand, Indonesia, Philippines, and South Korea are above 10%. For these countries, bulk of the costs goes to real estate agent's fees and sales and transfer taxes. Hong Kong, Malaysia and Singapore, countries with the highest transparency scores, have the lowest transaction costs. These countries do not impose additional taxes on sale and transfer of properties aside from registration fees. This shows that sales and transfer taxes can actually be removed. Removal of sales and transfer taxes would lead to a substantial reduction in transactions costs, up to 12% in the case of South Korea. Countries with the highest transaction costs are generally the ones with higher house-price-to-income ratios and large slum population. Given the high cost of property purchases, it is often cheaper for people to build houses on vacant properties. Since protection of property rights is generally weak, the situation is conducive to the creation of squatter colonies. Recent changes in tenancy laws have removed measures that inhibit the rental market. Legislation in Hong Kong, Japan and Malaysia has made it easier for landlords to recover their properties. Schemes such as key money, originally created in response to strict rent control, are still practiced even after market liberalization resulting in a system generally favorable to landlords. Rent and rent increases for residential properties can be freely negotiated in most countries in Asia except in the Philippines and Taiwan. Security deposits protect landlords from rent defaults, unpaid bills, and damage caused by tenants. In most Asian countries, security deposits amount to two to three months' rent. It is typically returned without interest, except in rent-controlled units in Taiwan and the Philippines. Tenant eviction is a serious problem in Asia, generally because of cumbersome and inefficient court systems. In Taiwan, Japan and Thailand, the number of days it takes to evict tenants exceeds 300 days. In response to costly and cumbersome legal systems, alternative dispute resolution (ADR) processes are generally available in Asia. Asian countries with higher transaction costs have bigger slums and less affordable housing.Sales and transfer taxes can be abolished to lower transaction costs. Rental markets in Asia are generally pro-landlord. Reduce or abolish excessive taxation of property transactions.Harness cooperatives and micro financing institutions to promote cooperative-based rental housing units.Promote the use of alternative dispute resolution.Abolish rent control in Taiwan and the Philippines to increase market efficiency.Utilize the internet to the fullest to increase real estate transparency.Open real estate markets to foreign investment. Establish a one-stop shop for property purchase registration and tax payment.